Project obstacles and solutions: The Henderson County School Corporation was building a new Early Childhood Learning Center and wanted a green building. They decided to use Insulated Concrete Forms (ICF) for the walls and pervious concrete for the parking lots. ICF greatly reduces heating and cooling losses and is recognized as a major contributor to 10 points that are awarded for Energy and Atmosphere (Optimize Energy Performance) in new construction by the USGBC LEED program. ICF walls create a continuous insulation barrier along with the thermal mass of the concrete between the forms that makes air infiltration nearly non-existent. 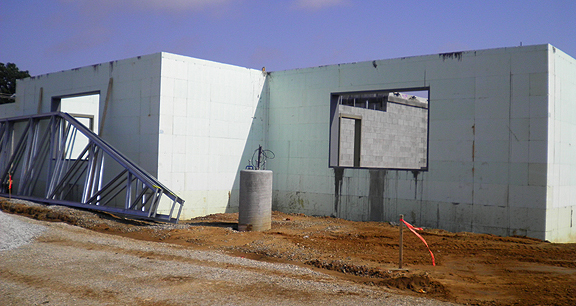 In many cases, HVAC units can be downsized for a building using ICF walls. Peyronnin Construction was the general contractor on the project and River Town Construction served as the concrete contractor. IMI supplied a high performance concrete mix with a high slump for the walls. This allowed the concrete to be placed into the walls without clogging the concrete pump. The concrete was self-consolidating and required no vibration to place. It is important that ICF concrete is placed without the use of vibration equipment, which can damage the insulated forms. It is also important that you pour ICF walls with a concrete mix that will fill all the voids to form a solid wall. Gaps can weaken a wall. IMI Technical Services monitored each load for proper mix requirements to ensure the concrete's performance on the job site. Since ICF walls are poured quickly - virtually non-stop - IMI made sure trucks were ready and waiting with concrete throughout the entire wall construction process. River Town Construction poured all of the curbs and sidewalks on the project. They also poured imix Eco Pave pervious concrete on the parking lots. The design called for a driveway that circled the building. These were poured with traditional concrete, which was sloped to the parking area, poured with imix Eco Pave pervious concrete. When properly placed, pervious concrete allows storm water to flow through its surface and back into the ground, eliminating the need for retention ponds. It also cleans pollutants out of the water and earns LEED credits for both controlling water quantity and quality. The parking area had an 8 inch stone sub-base under the pervious concrete to filter and hold any water runoff. Unlike traditional concrete, pervious concrete has to be poured and finished using a power screed, and then immediately covered for a seven-day curing process. Because it is a dry mix with zero slump, special attention has to be paid to the moisture content of the mix. Again, IMI Technical Services worked alongside River Town Construction to make sure the imix Eco Pave was to specifications coming off of the mixer trucks. In total, IMI supplied over 3,350 yards for the project. To learn more about ICF walls, click here. To learn more about imix Eco Pave pervious concrete, click here.